Femoral acetabular impingement, or FAI, occurs when the ball shaped femoral head does not permit a normal range of motion in the acetabular socket, known as the hip socket. This causes abnormal compression of the femoral head on the acetabulum. Damage, such as labral tears, can occur to the articular (or labral) cartilage. Symptoms include pain or a pinching sensation in the groin as you bring your knee towards your chest. The pain is often worse when you try to bring your knee towards the opposite shoulder. 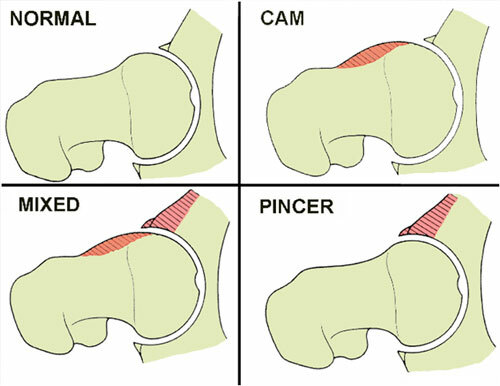 There are various contributing factors to femoral acetabular impingement. Three possible contributing factors include a CAM lesion, a Picher hip lesion, or a combination of the two. A CAM lesion is when the femoral head (ball) is larger than normal, or has a bump on it that jams on the rim of the acetabulum (hip socket). A pincer lesion is due to an over-deep acetabulum (socket), which restricts the movement of the femoral head. Studies have suggested that ‘CAM’ deformities are more common in males, while ‘Pincer’ deformities are more common in females. Mixed lesions occur when both a CAM and Pincer lesion is present. FAI has been speculated as a cause of premature hip osteoarthritis due to the abnormal motion leading to early wear and tear of the joint. Physical therapy may optimize alignment and mobility of the joint, thereby decreasing excessive forces on irritable or weakened tissues. It may also identify specific movement patterns that may be causing injury.